The laws of the serial killer movie have usually obeyed patterns much like those of the serial killers themselves, fitting a profile that is easily navigated by an audience but seldom too routine to come off as mundane. Think of this daunting task from the perspective of a federal agent; in the genre, he/she is responsible for piecing together a mystery in which the pieces are scattered in familiar ways, but always lead to less obvious outcomes. The same can almost always be said for the cinematic endeavor; movies in this vein open with the discovery of the killer's latest casualty, continue with scenes from the point of view of the murderer and/or victims, escalate into a cat-and-mouse mystery game, and ultimately end with unforeseen (but satisfying) jolts. Of course, not all films about these things can be called successful, but compared it to similar film genres and the result is not exactly a horrendous one, either. 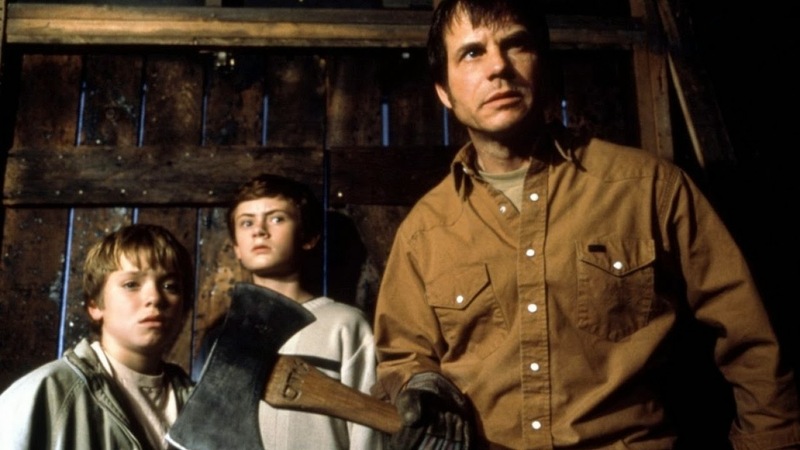 These ideas can typically be conveyed successfully depending on the creative thrusts of the director and the writer, but with the first minutes of "Frailty," the directorial debut of Bill Paxton, we slowly see the rug pulled out from underneath us. At this early point of the picture, in fact, the crucial murder and mayhem has already occurred; as the movie advances, we simply relive most of it with a narrator at our side, a witness to the killings that likes to add his own emotional spin on the events. But the question this time is not who committed the acts, but what component is the most horrifying: the fact that the murders happened at the hand of the narrator's own father, or the fact that he was an innocent kid when most of it unfolded? It's easy to see where these revelations might lead us, but this outing is ultimately so much more than just your average crime thriller. "Frailty" is dark, disturbing, twisted, thought-provoking, and probably one of the most well crafted and profound films to come out of Hollywood in the recent past. It is a film with a psychological thrust that tears us into pieces, and just when we think the torment will begin to let up, twists are unleashed that not only rock the foundation of the film's reality, but also take us almost completely by surprise. What's most ironic, but maybe important, is that the movie has almost no blood and gore in its content, encouraging the notion that the real horrors of cinema come through psychology, not gratuitous violence (although the movie's themes, still, are enough to warrant the attached "R" rating). As the movie opens, Agent Wesley Doyle (Powers Boothe) is summoned to his office in the middle of the night by request of an mysterious man, who has come to talk to the fed regarding a crucial murder case. This visitor, who calls himself Fenton Meiks (Matthew McConaughey), claims to know the identity of the infamous "God's Hand" killer, who has been wiping off random victims in the name of God for a good while, usually without leaving much evidence behind for authorities to pick up on (most of the bodies still remain missing, in fact). Doyle is intrigued but unconvinced, until Fenton begins to share with a personal story that at first comes off as implausible and far-fetched, but eventually begins to make sense (both to him and the audience). Fenton's tragic story begins when he was still a prepubescent teen, living alongside a younger brother named Adam, and a father (Bill Paxton) who dedicated all his time and energy to providing a stable home for them (it is also worth noting that Fenton's mother died after giving birth to his younger sibling). The relationships between the three are anchored by love, until one night Fenton's dad has a vision in which God tells him about the world coming to an end because of demons who plague the earth. When he tells his sons about how the Lord wants all of them to be "demon slayers" and carry out his will by killing them, Fenton is unconvinced and rather concerned; such claims, after all, are often the ramblings of a madman. The discussions continue on, alas, and soon Adam, the youngest boy, is persuaded onto his father's side of reasoning. Naturally, Fenton doesn't think much will come of it, but when dear old dad brings home a blonde woman bound and gagged, mercilessly slaughters her with an ax in front of the boys, and then buries the remains in the public rose gardens, he realizes just how serious the problem is. The picture stirred parts of my mind that haven't even been touched since I first saw Stanley Kubrick's "The Shining," in which a family unit crumbles as the result of a blizzard, and a caretaker's mask unexpectedly falls to reveal the identity of a horrendous madman beneath the surface. Like that film, "Frailty" is terror for the subconscious, not for the eyes. But whereas the former retains quite a few visually suggestive moments to further implicate the psychology, this new film has very few jolts and surprises. Instead, it's the kind of movie where everything that happens simply sits with us on the inside, never quite testing stamina, but instead twisting our senses and provoking internal hysteria. Paxton's very first outing as a director is a fine one, fueled by subtle strokes of genius behind the camera, and heightened by a script that, incidentally, is also the work of a beginner (Screenwriter Brent Hanley, in fact, has no other credits to his name other than a film that will be released next year). The movie's acting, meanwhile is topnotch; as the grown victim of an emotionally-scarred childhood, McConaughey is reserved but convincing, while Paxton conveys the seeming insanity of his characterization with genuine intensity. Something positive should also be said for the film's younger actors, Matthew O'Leary and Jeremy Sumpter; they play the two boys victimized by this brewing event in their lives like genuine professionals, who know exactly when to convey emotion and when to hold it back. Don't be fooled, however, by the premise I have described earlier; as I cautioned the viewer early on, much of the plot is surrounded by ambiguous details and blurred lines of reasoning, which may or may not lead to an expected outcome. By the closing shot of the picture, I was reminded of another solid thriller I saw recently, "Panic Room," and realized that a year which has already spawned countless unlaughable comedies can now officially be credited for unleashing some of the most effective thrillers of the new millennium. But Paxton's directing, unlike David Fincher's, is a lot more reserved and ominous in its mental thrust. It has also produced an unforgettable result that will remain preserved in the mind for a long time to come.